As a follow up to yesterday's post on line highlighting, it was mentioned in the comments that it's possible to use the side of your paintbrush to highlight the edges of your model. This is absolutely true. But... there are a few things you'll want to make note of before trying this particular approach. 1. Stray bristles are problematic. You should already be working with a good paintbrush for this so you won't need to worry about stray bristles that stick out from the sides. If you happen to have one or two, cut them away before giving this a go. 2. Pressure is everything here. Using this method, you really need to be aware of how much pressure you are applying to your brush and on the model. Too much and the paint will spread down both sides of what you're trying to highlight. 3. Watch the tip of your brush! This may be the biggest one. Even though you're using the side of your brush (and most likely up near the tip) you need to be careful you don't hit any other parts of the model with your brush tip while you're working. 4. Make sure your paint consistency is correct. This is up there with watching the tip of your brush. The previous method is somewhat forgiving, but this approach really does require you to have a good consistency of paint so that it goes on just right. 5. Check the model's edge first. And last but not least, some model edges are just not made for this approach. The best ones are the super sharp edges. If it's the least bit rounded, you'll end up with a wide highlight and not the crisp one you want. Just to expand on your point 4. Paint consistency is important and can be difficult to achieve because you need to keep the paint moist enough to get a clean line, but if it is too runny then it will simply flash off into the recesses and give you the exact opposite of what you are trying to achieve! For me, this is actually the only way to do line highlights. Once you get the hang of it, it becomes much easier and quicker than any other way. The method you laid out yesterday, actually requires more skill and concentration. Your hand must be completely steady. 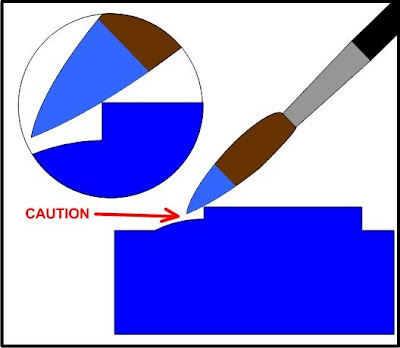 This method produces less mistakes, because the edge helps guide your brush (not your hand guiding the brush in the other method). Therefor less corrections are needed. The angle is very important, but if it is getting line-highlighted, it should be a raised portion of the model, otherwise it would get a blended highlight (like for muscles, faces, cloth, etc). Yes, your paint needs to be watered down, but then again, it always should. Wet-pallet really helps for this as well. Great tutorial here, I just think it should have come before the other one, because it's actually the easier method. Well, it is easier for you... remember that some people find some techniques easy, where others will have trouble with them! I know excellent painters that do lovely wet blending, but are no good when it comes to (what I believe to be) simple weathering!